The NRH300DP is a no-contact, Rotary Position Sensor that offers the optimal combination of performance, safety and cost. The sensor utilises proven Hall-effect sensing technology in a low profile (8mm) housing with a separate magnet for true no-contact sensing. The electrical output span can be set to correspond to rotations of 20° to 360°, and the positional information is determined by the angle of the supplied magnet relative to the sensor body. The maximum air gap between magnet and sensor is 5.5mm, while concentric offsets of up to 2mm can be tolerated with minimal impact on output linearity. 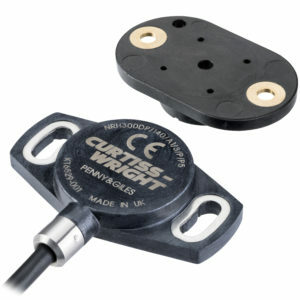 The magnet can be supplied in a convenient carrier, housed in a bolt, as a plug or loose. To enhance system performance, the NRH300DP has a second, redundant output that can be used for error checking in safety-critical applications. The versatile, factory-programmable electronics can be easily set to one of two analog voltage output ranges or one of three PWM frequencies. In addition, the polarities of each of the analog outputs can be independently set. On-board diagnostic functions ensure the outputs are put into safe, pre-defined states should an internal sensor error be detected. Connection to the sensor is with simple flying leads for customer termination.